This document is a technical summary of the Federal Highway Administration (FHWA) report LTPP Computed Parameter: Dynamic Modulus, FHWA-HRT-10-035. The dynamic modulus, |E*|, is a fundamental property of asphalt concrete mixtures that defines strain response characteristics as a function of loading rate and temperature. The significance of this material property is threefold. First, it is one of the primary material property inputs in the Mechanistic Empirical Pavement Design Guide (MEPDG) and software developed by National Cooperative Highway Research Program (NCHRP) Project 1-37A. (1) The MEPDG uses a master curve and time-temperature shift factors in its internal computations of modulus. In the MEPDG, the master curve is constructed using a hierarchical structure of inputs ranging from estimates based on mixture volumetrics and binder tests to physical tests of a particular asphalt concrete mixture. 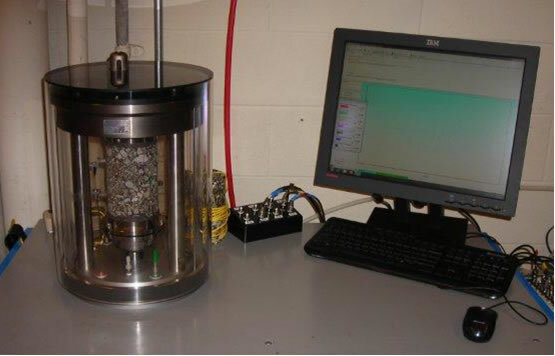 Second, |E*| is one of the primary properties measured in the Asphalt Mixture Performance Test protocol that complements volumetric mix design with mechanical properties (the testing equipment is illustrated in figure 1.). Third, |E*| is one of the fundamental linear viscoelastic material properties that can be used in advanced pavement response models based on viscoelasticity. Figure 1. Dynamic Modulus Test Setup in the Asphalt Mixture Performance Tester. The emergence of |E*| as the main hot-mix asphalt (HMA) property in the MEPDG occurred long after the materials tables were developed and populated for the Long-Term Pavement Performance (LTPP) program. It is not practical to perform MEPDG Level 1 laboratory |E*| tests on material samples from LTPP test sections due to a lack of materials, budget limitations, and the absence of an accepted test method for field samples obtained from relatively thin pavement structures. However, the LTPP database contains data that could be used to estimate the |E*| master curve and associated shift factors, which estimate |E*| at specific load durations and temperatures, and thereby develop inputs to the models contained in the MEPDG. Given the significance of |E*|, populating the LTPP database provides a valuable data source for the pavement community. Supplementing the full suite of material properties, performance history, traffic, and climate with |E*| estimates is advantageous in conducting MEPDG calibration, validation, and implementation. The primary objective of this project was to develop estimates of the dynamic modulus of HMA layers on LTPP test sections following the models used in the MEPDG. These data will provide a means of linking MEPDG inputs (for HMA analysis) to known field performance as measured on LTPP test sections. As part of this project, existing models used to estimate |E*| values were evaluated, and additional models were developed based on the use of Artificial Neural Networks (ANNs). The models utilize readily available mixture and binder information to estimate dynamic modulus. An extensive and independent database was required to develop the ANN models and assess the predictive capabilities of each model. At the outset of the project, the most comprehensive material database available was one compiled through the efforts of Dr. Matthew Witczak at Arizona State University. The Witczak database was modified to include only materials for which measured binder shear modulus values, |G*|, were found. Additional databases were developed to include mixture information collected as part of the FHWA Mobile Asphalt Materials Testing Laboratory projects and by Transportation Pooled Fund Study TPF-5(019), Full–Scale Accelerated Performance Testing for Superpave and Structural Validation, as well information from North Carolina State University. (2) In addition to compiling a mixture database, binder properties were compiled into a similarly expansive database. Existing predictive equations, including the original Witczak equation (NCHRP 1–37A), the modified Witczak equation (NCHRP 1–40D), the Hirsch model, and the law of parallel mixtures model, were evaluated for accuracy and potential bias. (1,2) This effort showed that, although each model has certain benefits, no single model is capable of highly accurate predictions over the complete range of necessary conditions. Furthermore, none of these existing predictive models could predict the |E*| values using only resilient modulus (Mr). As a result, the research team developed ANN models that yield reasonable and accurate predictions for the complete range of conditions needed. The most accurate ANN model was found to be the one that utilizes Mr as its primary input parameter. Mr, formerly the material property of choice for asphalt pavement strength characterization, was available for a number of LTPP sites and has been widely collected by highway agencies. Two additional ANN models were developed using mixture volumetric properties and a binder property as input variables. One model, the VV ANN, uses the binder viscosity and input frequency, whereas the another model, the GV ANN, uses |G*|. The model hierarchy used to compute |E*| values from information contained in the LTPP database is shown in figure 2 . The GV (|G*| and mixture volumetrics) and GV–PAR (pressure aging vessel (PAV) and rolling thin film oven (RTFO) aging) models, like the VV (viscosity and mixture volumetrics) and VV–Grade (binder grade) models, represent the same trained network, but they are identified by different terms due to the binder values used in each case. In the GV-PAR model, the binder values are based on two aging conditions, PAV and RTFO. In the VV-Grade model, the binder viscosity temperature susceptibility regression values are based on the specification grade of the asphalt binder, as recommended in the MEPDG. Because the LTPP database has a range of data available for different test sites, a hierarchal approach was used to select the best model to use for the available data, as shown in figure 2. Figure 2. Dynamic Modulus Prediction Model Hierarchy. The LTPP database was populated with |E*| values at five temperatures and six frequencies by using the prioritized ANN models. More than 1,000 layers in the LTPP database now have |E*| estimate information available as a result of this study. These populated values will allow users of the LTPP database to develop a master curve for independent analysis or for input directly into the MEPDG. In addition, master curve sigmoidal parameters and temperature shift factors were computed and included in the population effort. These layers have binder data available at a combination of different aging conditions: unaged (original), RTFO–aged, PAV–aged, or field–aged. Additionally, user–friendly software was developed to facilitate dynamic modulus computations. The executable software can batch process data from a file to compute large quantities of dynamic modulus estimates in accordance with the model hierarchy. The program also has a feature that allows the user to manually input known parameters and select a model to use in computing dynamic modulus. As part of this project, seven new tables were added to the testing module (TST) of the LTPP database. These tables include the inputs used in the predictions, |E*| estimates at five temperatures and six frequencies, sigmoidal functions (size and shape of the master curve), and shift factors. These new tables were made available in Standard Data Release 24 in January 2010. The software can be obtained at no cost from the LTPP Customer Support Service Center at ltppinfo@dot.gov or at 202–493–3035. Advanced Research Associates. (2004). Guide for Mechanistic–Empirical Design of New and Rehabilitated Pavement Structures, NCHRP 1 –37A Project, National Cooperative Highway Research Program, National Research Council, Washington, DC. Kim,Y.R., Underwood, B., Far, M.S., Jackson, N., and Puccinelli, J. (2010). LTPP Computed Parameter: Dynamic Modulus, Report No. FHWA– HRT–10–035, Federal Highway Administration, Washington, DC. Researchers – This study was performed by Nichols Consulting Engineers, Chtd. and North Carolina State University under contract No. DTFH61-02-D-00139. Availability – This TechBrief may be obtained from the FHWA Product Distribution Center by email to report.center@dot.gov, fax to 814-239-2156, phone to 814-239-1160, or online at https://www.fhwa.dot.gov/pavement/ltpp/index.cfm. Quality Assurance Statement – The Federal Highway Administration (FHWA) provides high quality information to serve the Government, industry, and public in a manner that promotes public understanding. Standards and policies are used to ensure and maximize the quality, objectivity, utility, and integrity of its information. FHWA periodically reviews quality issues and adjusts its programs and processes to ensure continuous quality improvement.